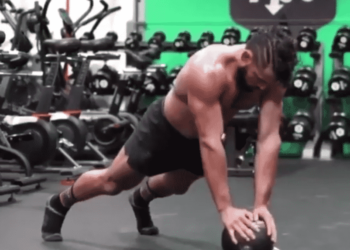 Eric Leija is a Senior Kettlebell Specialist at the ONNIT Academy. He is certified by the ONNIT Academy in Kettlebells, Steel Mace, Foundations, and Durability, as well as the IKFF, CPPS, and Animal Flow. 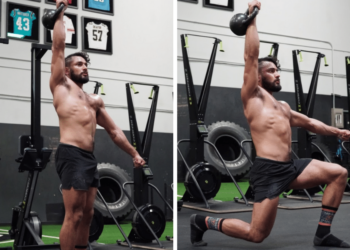 Known as the PrimalSwoledier, Eric is recognized for his signature flows integrating primal movements with kettlebell training. Eric is now a coach full-time at the ONNIT Gym in Austin Texas, and travels the country teaching his philosophy and kettlebell techniques. He has launched his own website (EricLeija.com) where he can further spread his unique and effective training style; he aims to promote a non-dogmatic approach to fitness that promotes exploration. BarBend is operated by JAKK Media, and we’re dedicated to the growth and promotion of strength training worldwide. BarBend covers a wide range of topics in strength, including training, nutrition, sports, news, analysis, reviews, and opinion. Whether you’re a seasoned lifter, new to the gym, or a dedicated strength sports fan, we’re your go-to source for the content you need to know! Our team of in-house editors has decades of combined experience in strength training content. The majority of reviews on our site are written based on their first-person experience and testing. We also feature content from dozens of top contributing writers, coaches, and athletes from around the world. And BarBend’s Expert Network features medical professionals, trainers, and researchers who help verify the accuracy of our content, specifically select training and reviews topics. Content that is Expert Verified is indicated at the top of each corresponding article. We also work to keep our content up-to-date and indicate the day of the most recent editorial updates at the top of our articles. BarBend is also the Official Media Partner of USA Weightlifting, the governing body for the sport in the United States. Is the 5:2 Diet the Easiest Form of Intermittent Fasting? Athletic Greens Whey Protein Review – Is Grass-Fed Better? Isopure Zero Carb Protein Powder Review: How Does It Taste? BarBend is an independent website. The views expressed on this site may come from individual contributors and do not necessarily reflect the view of BarBend or any other organization. BarBend is the Official Media Partner of USA Weightlifting. BarBend is not affiliated with or endorsed by CrossFit, Inc. or NPGL.